We are in the process of reviewing and revising older information on the site. but is repeated in this post. The rest of the June 2011 post remains unchanged for now. It may be revised in the future as time permits. The June 2011 post remains the same. There have been a lot of questions about motorized bicycles. We have answered them as they came and there were four separate posts on the same subject. This post replaces all of those and consolidates all the most recent information. Many thanks to all who have contributed with comments, but we will lose them with this post. Each of the questions is repeated here. James asked: Is it legal to ride a bike with a small motor on the roads in Florida? Motorized bicycles powered by an electric assist motor are bicycles as defined in the statutes, and lacking a statute to the contrary their operators have the same rights and duties as other vehicle operators. (2) Bicycle – Every vehicle propelled solely by human power, and every motorized bicycle propelled by a combination of human power and an electric helper motor capable of propelling the vehicle at a speed of not more than 20 miles per hour on level ground upon which a person may ride, having two tandem wheels, and including any device generally recognized as a bicycle though equipped with two front or two rear wheels. The term does not include such a vehicle with a seat height of no more than 25 inches from the ground when the seat is adjusted to its highest position or a scooter or similar device. A person must be age 16 or older to operate or ride upon a motorized bicycle. (2) No person under the age of 16 may operate or ride upon a motorized bicycle. For gas powered bicycles, see below. Frank asked: I tried looking up the fine for riding an electric bicycle (under electric power) on a sidewalk. Can you tell me what that may be? No person shall drive any vehicle other than by human power upon a bicycle path, sidewalk, or sidewalk area, except upon a permanent or duly authorized temporary driveway. A violation of this section is a noncriminal traffic infraction, punishable as a moving violation as provided in chapter 318. (3)(a) Except as otherwise provided in this section, $60 for all moving violations not requiring a mandatory appearance. There could be additional court costs that could be $100 or more. You should check with your local law enforcement agency for more information. Roxanne asked: I was pulled over today for riding my electric bicycle on the street. What are the laws about this? I was told I must to use the sidewalk and follow the pedestrian rules regarding intersections and traffic lights. The officer also implied that I needed bicycle insurance. See above about operating a vehicle by power on a sidewalk. If you are operating your bicycle on the sidewalk under human power, you have the rights and duties of a pedestrian, and must yield to pedestrians. Lacking a statute to the contrary, you are entitled to use the roadway just as is any other vehicle. A driver’s license is not required since a bicycle is not a motor vehicle. (1) Except as otherwise authorized in this chapter, a person may not drive any motor vehicle …. unless such person has a valid driver’s license …. Registration of your vehicle is not required for the state, nor is it a motor vehicle, so there is no requirement for state licenses. Local authorities may require registration. See this link. Insurance is not required. In the state of Florida, every person driving a motor vehicle registered with the state must carry the state’s minimum coverage. (1) Motor Vehicle – Every self-propelled vehicle which is designed and required to be licensed …. but not including any bicycle or moped. (1) Every owner or operator of a motor vehicle required to be registered in this state shall establish and maintain the ability to respond in damages for liability on account of accidents arising out of the use of the motor vehicle in the amount of $10,000 because of damage to, or destruction of, property of others in any one crash. Jerry asked: I’m trying to find out about Florida law on bicycles with a gas power-assist engine prior to buying one. a. Do the rules vary by county? I’ve heard that is ok, simply follow the rules of the road, have a headlight and tail light, and be over 16 years of age. No insurance or registering is required. b. I’ve seen two bicycles for sale, one with a 48cc engine, and the other with a 66cc engine. Would both engines be ok to ride on the street? c. Can you kindly refer me to a website link that further explains or reviews this? The vehicle you describe does not fit the legal definition of “bicycle”, since a “motorized bicycle” has an electric helper motor. A bicycle with a gas assist motor is not legal on the roadway or the sidewalk. It is not a bicycle, a moped, nor a motorcycle. See this post for additional information about mopeds. Additional information can be found at this DHSMV link. Below is a question and answer from that site. A company is advertising on TV a gas engine kit that can be added to a bicycle. The engine is tied into the pedal system like a Moped and it has to be pedaled to start the engine. It is advertised that the bicycle will be propelled to 30MPH. How is the tax collector supposed to register this bicycle/gas engine assembly? The definition of bicycle under s. 316.003(2), F.S., includes motorized bicycles. Bicycles are not registered or titled. Engine kits for bicycles are not new and there are a variety of kits available, however, they remain bicycles after the engine kit is installed. There are other requirements that must be met to be classified as a motorcycle/scooter/moped such as frame assembly and safety features. If a customer brings in paperwork for a bicycle, they cannot be legally issued a title or registration nor is it required. The agent should also direct the customer to law enforcement if there are any questions as to where the motorized bicycle can be used. One of our readers pursued this question further with the DHSMV and received this letter. He/she asked that the name not be published. There should be no difference in the state requirements in different counties. The traffic laws are uniform throughout the state, but counties or municipalities may impose local ordinances that do not conflict with state laws. When in doubt, ask your local Sheriff’s Office or police department. Melanie asked: I have done some research and have discovered that an electric scooter is classified as a bicycle if: It can be powered manually (by pedaling) as well as have a power assist electric motor not to exceed 750 watts, a 25″ seat at its highest extension and will not exceed 20mph. A drivers’ license is not required to operate a “bicycle” as defined by Florida law. Can an “electric assist motor scooter” be operated without a drivers’ license as well? Please do not refer me to the Florida statutes, I have gone over and over them and cannot come up with a clear conclusion of the law regarding this issue. If your vehicle is as described, it appears to meet the definition of “bicycle” in the statutes. If so, a driver’s license is not required. If it is not a “bicycle” and is a motor scooter, a driver’s license is required. There is no statutory definition of an “electric scooter”, “electric assist motor scooter” or “motor scooter”, but the DHSMV seems to place a motor scooter in the same category as the motorized scooter as defined below. “Motorized scooter” seems to apply to the toy scooters without a seat, which are not bicycles and are not legal on the roads or sidewalks lacking a local ordinance to the contrary. (1) A person who engages in the business of, serves in the capacity of, or acts as a commercial seller of motorized scooters or miniature motorcycles in this state must prominently display at his or her place of business a notice that such vehicles are not legal to operate on public roads, may not be registered as motor vehicles, and may not be operated on sidewalks unless authorized by an ordinance enacted pursuant to s. 316.008(7) or s. 316.212(8). If your vehicle is described as a “motor scooter” there may be additional requirements, and may be legal to operate on the roads. In order to determine those requirements, you must ascertain the specifications as stated by the manufacturer. The DHSMV link in the question above may be helpful. One paragraph from that site is quoted. You should contact your dealer or the manufacturer to determine the exact specifications and contact your local law enforcement office with this information to determine the applicable laws. regarding motor scooters, based on a Legal Opinion by the Attorney General, extracts of which are included. It refers to gas powered motor scooters, but does not address those with an electric motor. It also seems to contradict the material above regarding the definition excluding a seat. Motor Scooters- Are they legal in Florida? It is unlawful to operate a motor scooter as defined in Florida statute 316.003(82), on any roadway in Florida, unless the operator has a valid diver license. By a ruling of the Attorney General (AGO 2002-47) these vehicles are not subject to the equipment and safe driving requirements of a motor vehicle contained in chapter 316. However, if such vehicles are operated on the roads of Florida, the operator must possess a valid driver license per chapter 322.03. Are motorized scooters subject to the equipment and safe driving requirements of a motor vehicle or the provisions relating to mopeds or “electric personal assistive mobility devices” prescribed in Chapter 316, Florida Statutes? As of July 1, 2002, motorized scooters are excluded from the definition of “motor vehicle” for purposes of Chapter 316, Florida Statutes, and therefore are not subject to the equipment and safe driving requirements of a motor vehicle contained in that chapter, nor are the provisions relating to mopeds or “electric personal assistive mobility devices” prescribed in C hapter 316, Florida Statutes, applicable to motorized scooters. You have advised this office that the Department of Highway Safety and Motor Vehicles has stated that motorized scooters, are subject to the regulations regarding equipment and safe driving requirements of a motor vehicle as mandated by Chapter 316, Florida Statutes. In addition, the department, relying on the opinion of the Second District Court of Appeal in State v. Riley, has concluded that a motorized scooter driver is required to have a driver’s license. Section 67 of Chapter 02-20, supra, also adds subsections (82) (definition of motorized scooter above) to section 316.003, Florida Statutes, which respectively define “motorized scooter”. In light of the above, the Legislature may wish to readdress these issues and clarify its intent regarding the operation of motorized scooters in this state. Accordingly, I am of the opinion that as of July 1, 2002, motorized scooters are excluded from the definition of “motor vehicle” for purposes of Chapter 316, Florida Statutes, and therefore are not subject to the equipment and safe driving requirements of a motor vehicle contained in that chapter, nor are the provisions relating to mopeds or “electric personal assistive mobility devices” prescribed in Chapter 316, Florida Statutes, applicable to motorized scooters. A license is not required to drive a bicycle with an electric assist motor if it meets the definition of “bicycle”. Operating a bicycle with a gas assist motor is not legal on the roads. See the other posts about motorized bicycles. I live in Archer Fl. & I have no problems w/police nor officers of the law in me riding my gas powered bicycle into work & they have also waved me on with no warning of this so-called law, because they know that it can be beat in court with loopholes in the law. So I will continue in riding my gas powered bicycle into work. Have a wonderful day to you all. My brother lives in Williston got a ticket for driving without a license do you have any input to help fight this? What are the loop holes because I have to go to court for a motorized bicycle infraction? The latest DMV Procedure RS-68 cleared it all up. If your vehicle is an eBike by statutory definition or a moped, it would be legal. Otherwise, it is not legal. See the link in the post above. There is a difference between the law and what the police actually enforce. There are some areas in Florida in which law enforcement is very strict about gas assist motor powered bicycles. If your brother was operating a bicycle or eBike that meets the definition of bicycle, a license is not required. See the posts about that on this site. Without knowing the circumstances, we cannot determine if your brother may have been violating the law. You should retain an attorney for legal advice. what if you buy a Wheelman 50cc Gas Skateboard , what classification does that fall under, can i ride that around on the street and sidewalks? 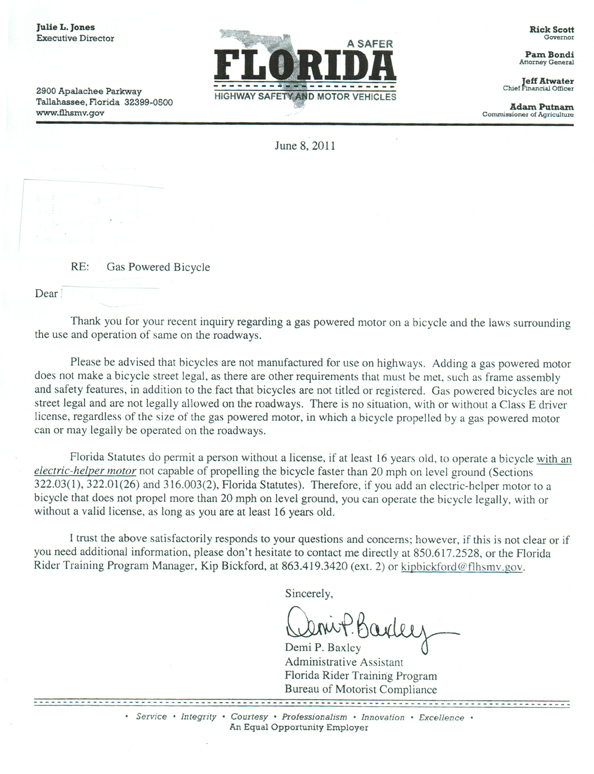 PS UPDATE florida DMV site and letter stating there Revision(s) to this Procedure: New Procedure. I am not aware of a state state statute that prohibits motorized bicycles on the beach however, many of the beaches are state, county or municipality park property and the local regulations may prohibit vehicles with power other than human power. Some prohibit all vehicles, which would include bicycles. If the regulation prohibits only motor vehicles, an eBike should be allowed if it is as defined in the statutes as a bicycle and not a motor vehicle. I recommend asking the officer or going to the police station in which the beach is located and asking the duty officer to quote the regulation or ordinance that the officer used. I have followed this post for a while, but I am still confused about something. First, “fine for riding an electric bicycle (under electric power) on a sidewalk” is mentioned as using electric power on the sidewalk being wrong. Then, it is mentioned just below that, another person was using their bike on the road, and that was also wrong. Could you explain? Is it legal to ride an electric bike, using electric power (pedal-assist) in the bike lane? Is it legal to ride an electric bike, using human propulsion, on the sidewalk? Bicycles with electric assist motors are considered bicycles if they meet the statutory definition of bicycle. No registration or driver’s license is required. Operators of bicycles have the same rights and duties as other drivers when on the roadway, which includes a bike lane. The most basic right is the use of the roadway. Cyclists may use a sidewalk unless a local ordinance prohibits it. Vehicles, including bicycles, may be operated on sidewalks only under human power, except motorized wheelchairs and, under very limited circumstances, golf carts. 1. My e-bike tops out at 20mph. What happens if I take it over 20mph under my own power? 2. What if its capable of going over 20mph? Does this make it a “motor vehicle”? Especially for question #1 as I’ll always be pedalling. I have no license. I would like to know so I don’t get arrested. I can’t seem to fathom calling my 20mph++ 750watt e bike a “motor vehicle” if I humanly propel it over 20mph and the electric help tops out at 20mph. Any speed over the 20mph is human power only. When clocked at 30mph and stopped for an e assist going over the 20mph it is understood that if the e assist cuts off at 20mph the only way the bicycle can go over that speed is by human power only. Once the e assist motor is disengaged at 20 mph you are now human power only at that point and a bicycle doing 30 mph under human power. A traffic light has a combination of a red light, yellow light and a green light. Trying to imply that the word combination means simultaneously is where you can see that, that argument would be rendered useless. Certainly a traffic light is a combination of three colors and certainly they are not operated simultaneously, under normal conditions. It’s absurd to consider that the vehicle is a bicycle without the motor and that adding the motor, which will not reach 20 mph unassisted makes the vehicle not a bicycle, under the wording of the statute. I can exceed 20 mph in my velomobile without an electric assist, does that make my vehicle not-a-bicycle? It is also clear from the statute that if your electric assist motor is capable of powering the vehicle at more than 20 mph on its own, it is not a bicycle and would require registration as a moped and a driver’s license to be operated legally on the roads. The wattage is not relevant, since that is not discussed in the statute. If the motor combined with human power produces speeds greater than 20 mph, it is less clear. So you would have to show that the e assist is programed to shut off the motor at 20 mph leaving you with a total human power bicycle that has to comply with the posted speed limits. As long as your eBike meets the FL statutory definition of “bicycle”, you shouldn’t have a problem. (2) Bicycle – Every vehicle propelled solely by human power, and every motorized bicycle propelled by a combination of human power and an electric helper motor capable of propelling the vehicle at a speed of not more than 20 miles per hour on level ground upon which any person may ride …. This is the most ridiculous web site I ever read. There is no correct answer, it just keeps going around in a circle. I am a Hospice pt and all I want to know is, do a need a friggin drivers licence to ride an electric bicycle around. Yes I will need to go on the streets, not highways just local streets. Ok so I have question I was planning on building my own motorized bicycle I’m a big guy 6’6″ about 280 I need something to move my big but down the road planing to just ride it to work witch is like 2 miles from my house maybe 3 but I was going to get that new bicycle with the big tires on it from WalMart and put a 22hp (670cc) motor on it disc brakes and lights now soul that mean I need to plate or as a moped or is “state law” telling me I cant ride it? Your vehicle would not be a moped. See the other related posts on this site. (77) Moped – Any vehicle with pedals to permit propulsion by human power, having a seat or saddle for the use of the rider and designed to travel on not more than three wheels; with a motor rated not in excess of 2 brake horsepower and not capable of propelling the vehicle at a speed greater than 30 miles per hour on level ground …. If you could get it registered with the DMV, it would be a motorcycle and would need a title, license tag and you would need a driver’s license with a motorcycle certificate. Why not just use it without a motor and avoid all the problems. No registration, driver’s license etc. I have a tadpole human powered trike with 2 front wheels and 1 rear. the seat height is adjustable between 6 inches and 12 inches. If I purchased an electric assist motor, would I legally be allowed to ride it in a bike lane/local street/sidewalk? Your vehicle is not a bicycle since the seat height does not meet the statutory definition. If powered by an electric assist motor, your vehicle would not be legal on the roadways since it is not the defined “motorized bicycle” with a seat height of at least 25 inches in the statute. That definition was written before trikes and recumbents became popular, so that may not have been intentional, but that’s the law. Note that the statutes impart the rights and duties of other drivers to operators of “human powered ” vehicles, and not just bicyclists. You can operate your vehicle under only human power in the roadway, including the bike lane, and on the sidewalk or bike path. See the details and statutes in the posts and comments above. I hope someone may be able to help me. I live in the UK and own a 1958 Göricke bicycle fitted with a 1960 Rex 49cc engine. It can do around 25mph flat out and has lights but no turn indicators. Here in the UK all motorised bicycles are classed as mopeds and have to be registered, insured and inspected. The rider must have a moped licence and wear a motorcycle helmet. They cannot be ridden on cycle paths or in cycle lanes. It is my aim to fly into Miami with the machine and ride it to San Diego CA to raise funds for a local charity. I know that I can import it into the US temporarily as a visitor for up to one year. I am unclear however, if I would be able to ride it on the roads of Florida? Posts on this discussion seem to say that bicycles cannot be ridden on the highways of Florida. Does that mean ALL roads, or is a ‘highway’ a specific type of road in Florida? The federal temporary import rules say that the ‘vehicle’ must conform to the rules of it’s country of registration. So if my UK registration documents show it as a ‘moped’, would that satisfy a FHP officer, even if it did not qualify as a moped in Florida? Whether your vehicle meets the requirements as a moped and your driver’s license will suffice in the US is beyond the scope of this site. I suggest contacting a moped dealer here. The term “highway” includes all streets and associated property. (1) Any person operating a motorcycle or moped shall be granted all of the rights and shall be subject to all of the duties applicable to the driver of any other vehicle under this chapter, except as to special regulations in this chapter and except as to those provisions of this chapter which by their nature can have no application. 1. When overtaking or passing another vehicle proceeding in the same direction. 3. When reasonably necessary to avoid any condition, including, but not limited to, a fixed or moving object, parked or moving vehicle, bicycle, pedestrian, animal, surface hazard, or substandard-width lane, that makes it unsafe to continue along the right-hand curb or edge. For purposes of this paragraph, a “substandard-width lane” is a lane that is too narrow for a moped and another vehicle to travel safely side by side within the lane. (b) Any person operating a moped upon a one-way highway with two or more marked traffic lanes may ride as near the left-hand curb or edge of such roadway as practicable. (3) A person propelling a moped solely by human power upon and along a sidewalk, or across a roadway upon and along a crosswalk, has all the rights and duties applicable to a pedestrian under the same circumstances, except that such person shall yield the right-of-way to any pedestrian and shall give an audible signal before overtaking and passing a pedestrian. (4) No person shall propel a moped upon and along a sidewalk while the motor is operating. (1) No person shall drive a vehicle onto or from any limited access roadway except at such entrances and exits as are established by public authority. Minimum speed restrictions, usually 45 or 50 mph, maybe posted at the entrances to such facilities. I want to buy a 4 wheel pedal powered ( bike for 2 ) factory built vehicle which is like two bikes hitched together, for two people. It does not quite fit the definitions that I have seen on this site, but is no different than two bikes traveling together. It is sold as a “Rhoades Car”. If I install an electric assist motor, how will it be considered? I am looking into purchasing or building an ebike in Orlando. 1) Is it an issue in FL if it has both pedal assist and throttle control? Does the pure throttle option disqualify it as bicycle? 2) Some models appear to have pedal assist that tops out at 20 mph if pure throttle, or 28mph before disabling motor if combined with human pedaling. Is there any further clarification on this issue for FL, or is this in violation due to the motor still running above 20mph? 3) There are lots of local trails that prohibit motorized vehicles. Am I OK legally so long as I turn off the motor? 4) If I add a second motor to the front to make it 2WD, does the 750 watt requirement mean I can’t go over 750 combined between the two? 5) Can I run higher voltage (60-90) in order to get more torque within 750 watt requirement, or am I hitting some other legal limit like horsepower? The statute about human powered vehicles on sidewalks and bike paths does not prohibit motor vehicles on the sidewalk with the motor power off. It refers to the actual means of propulsion and not the type of vehicle. You should check with the authority having jurisdiction for the wording of the ordinance in effect. It may be more specific. The definition of motorized bicycle does not mention the 750 watts, only the speed under power. Your other questions are not addressed in the laws. For a discussion of those topics, please refer to this post, also reading the links and comments. Hi, I’m also interested in the question G-Man asked: Is it an issue in FL if it has both pedal assist and throttle control? Does the pure throttle option disqualify it as bicycle? The link that Geo provided did not answer the question. Would I have to disable the throttle control option in order for it to qualify as a bicycle? Thank you! Neither the statutes nor Procedure 68 address the throttle. If your vehicle meets the statutory definition of “bicycle” then it is one. Can you ride a pit bike/dirt bike on the steet going the speed limit? The federal code to which you refer is likely that of the Consumer Product Safety Commission and has no bearing on state traffic laws which define a motorized Bicycle. See the numerous posts on this site about motorized bicycles. I recommend that you retain legal counsel. 3 Pings/Trackbacks for "Motorized Bicycles"